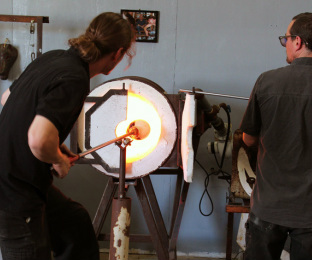 An art glass studio is filled with “hot stuff.” There is a furnace in which clear glass is melted. The glass is held inside a crucible, pictured at the right. There is a “Glory Hole” where the glass blower forms his or her work; an oven that keeps pipes and punties hot; and an annealing oven to slowly cool down finished work. 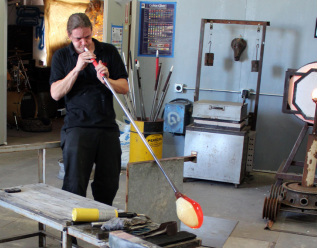 A piece begins when the glass blower reaches inside the furnace and into the crucible that is filled with clear, melted glass and “gathers” a layer of molten glass on the end of a steel blow pipe. 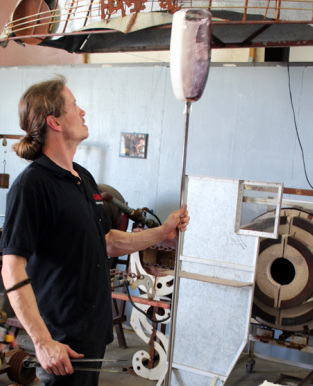 The artist then rolls the molten glass on a steel table called a marver to give it a cylindrical shape. The glass is then heated in the glory hole – all the while the artist is turning the blow pipe and keeping it in constant motion. There will be many trips back and forth to the Glory Hole because the glass needs to be kept above 1000⁰ F.
Next, it’s time to add color to the piece. Various forms of colored glass such as powders, frits and bars are used to create varied patterns and designs in the piece. The artist takes the heated glass on the blow pipe and rolls it over the color, picking up pieces with each roll. Then, it’s back to the Glory Hole where the colored glass is heated to melt into the clear. Again, the glass blower keeps turning the pipe to keep the shape at the end of the pole. The glass blower sits and rests the pipe on the steel “arms” of the bench and turns it with one hand. With the other hand the artist uses tools such as cherry wood blocks, wet newspaper, wooden paddles and tools made of stainless steel. This process requires perfect coordination between right and left hands. The artist may be shaping a round piece, an oval, or intend to make a wide open plate or bowl. Sitting at the bench is where she determines the shape. The artist may decide to add more clear glass or color. The process of heating and turning in the Glory Hole and shaping at the bench will be repeated many times. The actual blowing begins. It starts with a puff on the end of the blow pipe to create a bubble. Then it’s back to the Glory Hole for more heating and turning. And back to the bench for more shaping. This cycle gets repeated many times, depending on the size and shape desired by the artist. Once the shape is satisfactory, the piece has to be transferred to a “punty” – another steel pipe that’s been heating over flames. Moving the piece from the blow pipe to the punty will make it possible for the artist to create the opening of the vase or the bowl. The punty will be attached to what will become the bottom of the piece. The artist – or an assistant – takes a small gather of clear glass from the furnace. As the glass blower seated at the bench briefly stops turning the piece, the punty with the molten glass is attached to the other end. At the right moment, the artist “raps” the blow pipe and it breaks away, leaving the piece attached to the Punty. This is a tricky step in the process and the transfer sometimes results in a dropped piece. Since glass is hard to “rescue” that usually means starting all over! Using Kevlar gloves, the artist picks up the scorching-hot piece and quickly transfers it to an annealing oven. This oven is kept at 960⁰F and then cooled down over a period of 14 hours to room temperature. 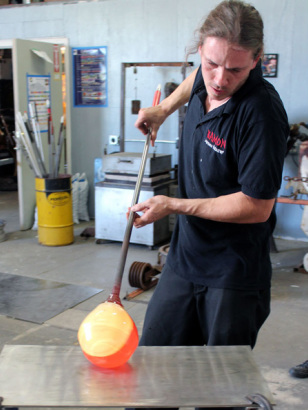 This slow cooling down is to prevent the piece from cracking or breaking – although glass blowers sometimes get a few unhappy surprises when they open the oven the next day.Finally, if needed, the artist grinds down the bottom of the piece to eliminate the sharp edges that were left when the piece was knocked off the punty. 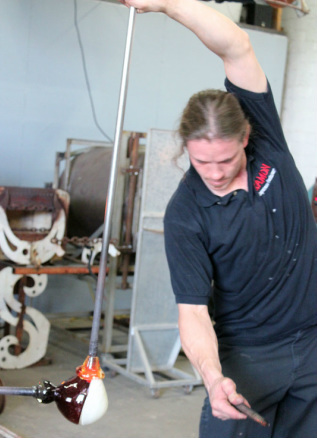 Glass blowing requires extreme patience, tenacity and dexterity. 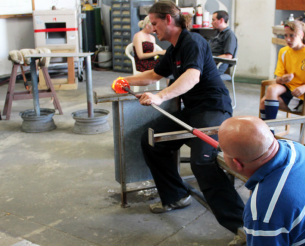 That said, people of all ages and many physical abilities (including people confined to wheelchairs) have learned to blow glass and delight in its magic. Some pieces are so large and complex it takes team work. 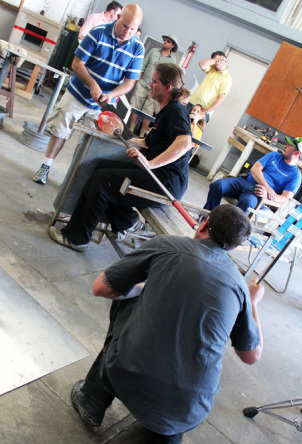 René turns and shapes the piece while one assistant puffs into the pipe and another hold a cherry wood paddle to deflect the heat from the hot glass, protecting his right arm. René reaches into the crucible for a gather of molten glass. This move begins the entire process. An assistant opens the door to the furnace as René heats up glass on a punty. After taking the glass from the furnace it is rolled on a cold steel surface to create a general shape. René forms the piece at the bench, constantly turning as his assistant blows into the pipe. 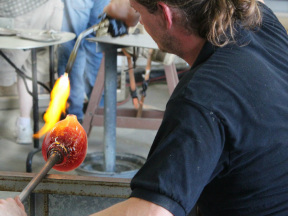 René heats up a spot on the molten glass to later attach a handle. René checks the shape of a piece just before he breaks it off from the punty.